Two legends go head-to-head on AXS TV, as celebrated musician, author, entrepreneur and Rock And Roll Hall Of Fame inductee Gene Simmons sits down for an in-depth discussion with award-winning newsman Dan Rather for a special edition of "The Big Interview" tomorrow night (Tuesday, September 30) at 8:00 p.m. EST / 5:00 p.m. PST. Rather pulls no punches during the hour-long episode as he takes viewers on a journey into the unprecedented life and career of the outspoken musician and businessman, from his life and loves, to his views on the music industry and his passion for America. In an emotional account of his childhood, Simmons reflects on his youth in Israel, surrounded by war and poverty, with no electricity and lacking amenities like toothpaste. Opening up about his mother's time in the concentration camps of Nazi Germany, Simmons reveals the profound impact that she had on his life, and the powerful experience of watching her be sworn in as an American citizen when he was eight and a half years old. Simmons is in rare form throughout, allowing Rather to get surprisingly personal, and eliciting a side of the superstar that isn't often seen on stage or television. From his father abandoning the family when Simmons was just seven years old, inspiring his decades-long fear of commitment and reluctance to have children; to his high-profile liaisons with Cher and Diana Ross; as well as his marriage to Shannon Tweed, the issues they've overcome, and the decision to open up his life, home, and children to the world on the hit reality show "Gene Simmons Family Jewels" which airs on AXS TV. No stone is left unturned. While Simmons may have finally settled down as a family man, his career, both as an entrepreneur and a founding member of KISS, has, arguably, never been hotter. With the band's blockbuster 40th anniversary tour well underway, Simmons delves into the origins of KISS, their refusal to play the pop music game, and their commitment to being completely authentic and original as they smashed through the '70s folk scene and changed the face of the industry forever. For him, the rock is his religion, the stage is his church, and the show is two hours of pure magic fueled by sweat, fire, and fake blood. It's this same drive, what Simmons describes as "the working man's ethic," that has helped him build a multi-million-dollar empire that includes a record company, restaurant chain, race horse operations and an Arena Football team, and earned him a lifetime achievement award from Forbes magazine in 2012. The best-selling author's newest book, "Me, Inc.", designed to help people unleash their inner rock god in both life and business, is due out later this fall. 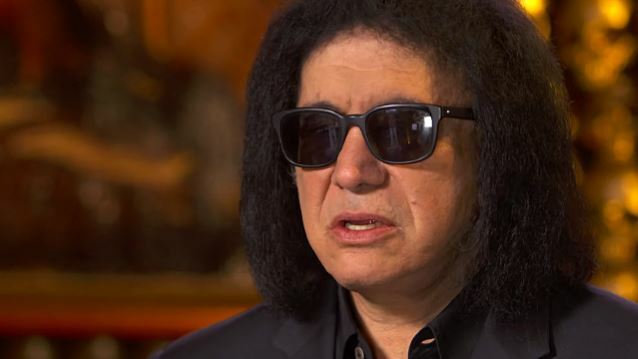 "Gene Simmons has never been shy about delivering the straight truth as he sees it, and this episode of 'The Big Interview' is no exception," said Michele M. Dix, AXS TV's senior vice president, programming and development. "But what sets this particular segment apart is Dan Rather's unique ability to dive head-first into his subject, setting the rock star bravado aside and cutting to the core of the man underneath the makeup and the carefully cultivated 'Demon' persona."